Today’s feature is Pariskhit Thoppian and his brand Thoppia which was established in 1998. Thoppia is derived from ‘Thoppian’ which is a name of the traditional weavers’ family from Kerala. Thoppian’s are one of the most authentic fabric manufacturers in India with their products being appreciated all over the world. Let’s find out more about the brand from the founder himself. What are the products that Thoppia offers? We offer the widest range of soft furnishings for your home that are 100% cotton. We combine traditional handicraft with the latest fashion trends to give you products that are durable, and modern. How is Thoppia different and unique? We are a family run business and Thoppia represents the 3rd generation working with textiles. Time-tested traditions of weaving and decorating fabric combined with modern technology helps us create highly robust and durable fabric. The entire life cycle of the fabric, which is choosing the yarn, dyeing it, weaving it, and then stitching is done in-house under close supervision. This gives us great control over quality standards and preserves authenticity. According to you, what has been the biggest challenge you’ve faced while establishing your brand? Since we have started, building a brand that customers trust and prefer has been our biggest challenge. What according to you is a superstar feature in ShipRocket? Select from the list below. Automated Billing Reconciliation: It is easier to focus on core business activities when tasks such as billing reconciliation are automated. It reduces effort and is hassle-free for sellers like us. 26000+ serviceable pin codes: With the satisfaction of reaching the most number of pin codes, ShipRocket ensures that we reach all our customers. Cheapest courier prices: This feature is a super star feature because when shipping is light on the pockets, it’s always a good feeling. Advanced reporting dashboard: It reduces confusion and enables us to handle all the aspects from one single platform. Talk about convenience! One stop solution for your complete business: No more tug-o-war with the numerous steps and features required to run a successful business. ShipRocket has been like a blessing with its one stop solution for complete business-related activities. With KartRocket & Kraftly also in place: It helps to have other marketplaces and means to extend one’s approach and reach. What role has ShipRocket played in helping you excel? Our core competency is textile, not shipping and logistics. 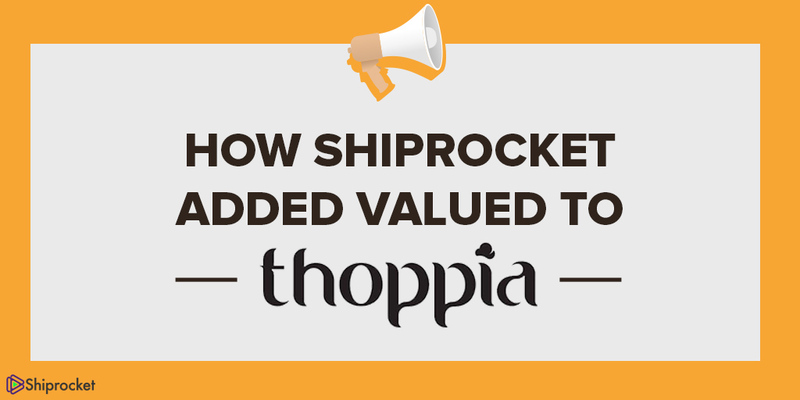 These features combined with many others have really helped us focus on our core competency while Shiprocket takes care of our last mile connectivity. We wholeheartedly rely on ShipRocket to take care of the logistics as we focus on establishing a brand name which is synonymous with quality and substance. Without ShipRocket it would have been extremely difficult to manage orders in such an orderly and efficient manner. How did you tackle the logistics of your business? We have been with Shiprocket from the onset of our online venture. We handed over the responsibility of logistics to ShipRocket and took a back seat as we trusted the company’s reliability and customer care. We at Thoppia have not been disappointed with the services offered and strive to become an even better brand. If you too want to tell the world about your brand and what makes it unique. All you need is to fill in your store details on ShipRocket featured page and we will share your Start-up Saga on our page.